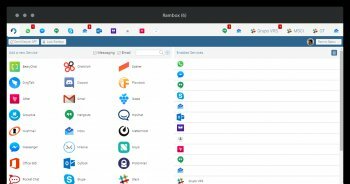 Rambox is a Free and Open Source messaging and emailing app that combines common web applications into one. Use AIM, Slack, WhatsApp, GroupMe, Facebook Messenger, Gmail, Outlook, Telegram, and other services in an all in one app. It's perfect for people who work with many services for business and private accounts.